Maybe I’m cheap or maybe I’m frugal but either way, I have a hard time throwing out dilapidated supers. This is my last attempt to breathe life into my original boxes. treated. My latest act of malevolence was when I dropped the box about 8″ filled with honey to knock out the last of the bees. Not only did this break the ears off of most of the frames but it made, the already weak corners, come apart. So I used 1/4 hardware cloth to repair it. The inside lip was also rotting away, so I used the wire to make a new ledge. If it works, great. I’ll get another season or two out of the box. If not, nothing lost. One day, and I hope soon, I will have enough return on my honey investment to buy good wood and plastic frames but until then… waste not, want not. 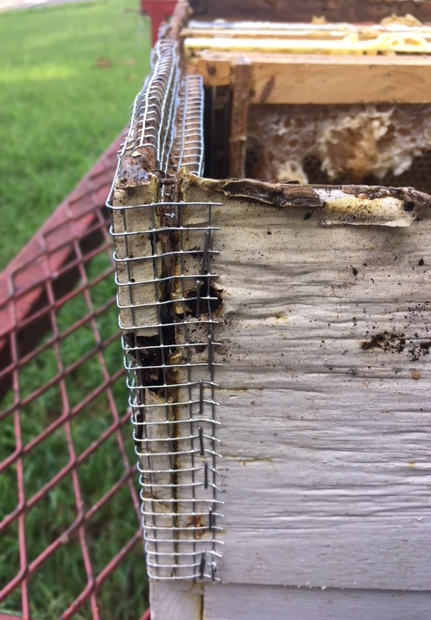 The 5 frame nuc I made has about 7 to 10 queen cells in it. I moved it out to Dr.D’s Saturday. It seems fairly strong and I think it might just make it through the winter – if the beetles don’t kill it first. BEETLES! All of my hives are filled with beetles. 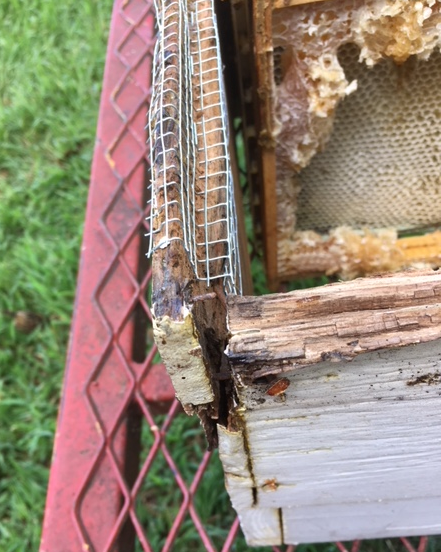 Luckily the hives are strong and are keeping them beat down but the beetles are there and just waiting for their chance to destroy the hives. Wednesday, I will place a swiffer sheet and a Fat Bee-man Trap (though I am not convinced they work) into each hive. I’ve also broken down and ordered beetle blaster traps for all 20 hives ($48 with S&H) and will put them in as soon as they arrive – they work great but are too pricey. I think the apocalypse is near and the mosquitoes might be the fourth horseman. I’ve never seen mosquitoes this bad before. 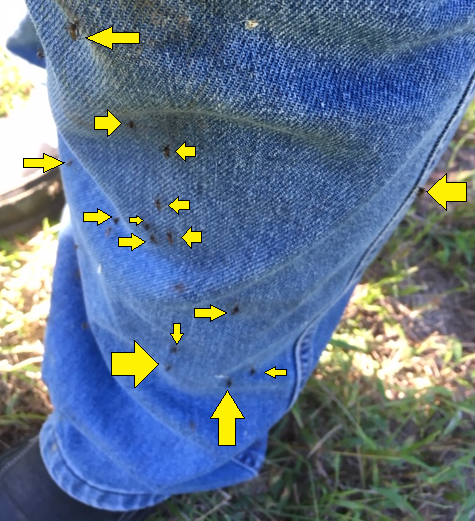 This pictures shows my pants leg but I was covered from head to toe. And it wasn’t just out in the country – I must have killed 30 or more in my house that flew in as I came in the front door. Maybe these incredibly hot days we are having this week will kill them back – I hope so anyway. Harvest Continues: Well I’ve harvested 8 deep boxes and have gotten about 25 gallons now. I still have about 12 boxes to go.